Who doesn’t love bulldogs? Their squishy faces, snorty noses, stubborn personalities and awkward limbs make them cutely comical. According to the American Kennel Club, English bulldogs have been the fourth most popular registered dog breed in the United States for the past several years. While the pet-owning public may love bulldogs, veterinarians have an entirely different perspective on these dogs. 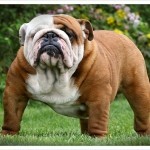 There’s a long running joke in our industry that the bulldog breed alone can keep a veterinarian in business. Why? When we genetically select for and breed for purely cosmetic traits (such as excess skin folds, malformed legs and a pushed-in nose), there is a significantly negative impact on the health of the animal. 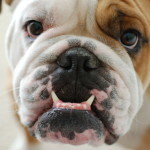 In fact, there is an entire syndrome named just for the breathing problems seen with bulldogs and other breeds with malformed faces: brachycephalic airway syndrome. They may look cute but bulldogs can’t breathe, are riddled with severe skin and ear infections, have trouble walking as they age and are so heat intolerant they often fall victim to heat stroke. Couple these major medical problems with the fact that bulldogs cannot be born naturally due to the excessive size of their skulls (virtually all of these dogs are delivered by c-section surgery), and it’s amazing the breed has remained so popular. Genetic researchers at the UC Davis School of Veterinary Medicine have recently published a paper in which they express concerns about the long-term viability of the breed, given the extreme health problems and lack of genetic diversity in the bulldog breeding pool. Bulldogs are some of my favorite patients, but they are not healthy animals. The breed deserves more from us than a focus on looks at the cost of health and longevity.